Hi Mate, I'm after some MT500 panniers if your still selling yours? appreciate your original message was posted some years ago, but are you still offering the jerry can rack for an MT350? 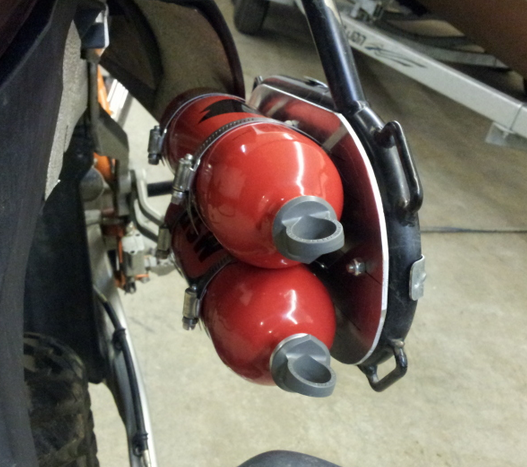 If so I'd be interested in buying one with the fittings for my MT350. I'm hoping to do a batch in the next couple of months but I gather you are wanting the rack but with the donut fittings to go on the front of a MT350. All I have left at the moment are some brackets that will slide on the donuts but have plates on the back to attach to whatever you want to carry - box/rucksack carrier etc. I will post a pic of these as they're useful too. I'll do a post when I collect the steel and get started. MT Pocket wrote: Hi Rich. Hi Ady, did you make some more racks for the 350's? As I'd be interested in a set if you have. Have you thought about making some that fit on the back of a 350 like they both on the 500? Deepening on wether I could hide the cost from my wife, I'd consider a set of front and back. I'll post again when I collect the metal for more racks. OK that would be great.